NEW YORK, United States, Wednesday November 22, 2017 – The United Nations’ Economic Commission for Latin America and the Caribbean (ECLAC) has presented a debt for climate adaptation swaps proposal for Caribbean countries ravaged by hurricanes during this year’s Atlantic hurricane season. Director of ECLAC’s Economic Development Division, Daniel Titelman presented details of the proposal on Monday – day one of the CARICOM-UN high level pledging conference at the UN. It is based on the creation of a Caribbean Resilience Fund (CRF) which is expected to provide financing for investment in climate resilience, green growth and structural transformation in the economies of the region. ECLAC said the proposal, which was originally launched in late 2015, has already been put into consideration in several international forums. Titelman reminded that the total Caribbean debt burden mounted up to US$52 billion in 2015, representing more than 70 per cent of the its gross domestic product (GDP). He explained that this debt has been rooted in external shocks, compounded by the inherent structural weaknesses and vulnerabilities, particularly extreme weather events. And he said the accumulation of debt has been caused by increased expenditures to address the impact of these extreme events and climate change attendant difficulties, since most Caribbean countries are located in the hurricane belt and are also prone to earthquakes and other hazards. On top of this, the ECLAC director warned that the upper middle and high income classification of the majority of Caribbean countries poses a number of challenges, among which the most important are limited access to concessional external finance and a decline on official development assistance to the Caribbean. Also, GDP per capita criteria failures to take into account threats from natural disasters such as hurricanes as well as economic shocks. In this context, ECLAC said its debt relief proposal for the Caribbean aims to help these economies mitigate and adapt to the consequences of climate change while trying to reduce the debt burden, increase growth and achieve the Sustainable Development Goals (SDGs) of the 2030 Agenda. In her speech, Director of ECLAC’s Subregional Headquarters for the Caribbean, Diane Quarless paid tribute to the indomitable resilience of spirit demonstrated by the government and peoples of the countries devastated by the recent superstorms. 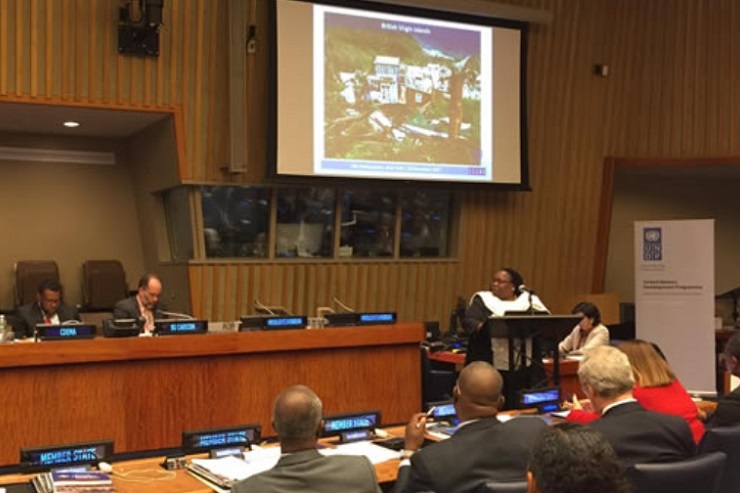 She also described the actions taken in the five countries for which ECLAC conducted its Damage and Loss Assessments methodology post Hurricane Irma and Maria: Anguilla, the Bahamas, British Virgin Islands, Sint Maarten and the Turks and Caicos Islands. “We are resolved to collect the data that present the most accurate picture of the degree of the subregion’s vulnerability to extreme climatic events,” she stated. Quarless also emphasized that ECLAC has undertaken substantive research and focused economic assessments of the challenge which climate change poses to the economies of the Caribbean across a range of sectors, including agriculture, freshwater, health and tourism, providing a framework complete with data, parameters and other measures that can be used to inform economic policy dialogue in responding to this challenge over the medium term. “It is for these reasons that ECLAC has been championing a debt for climate adaptation swap initiative; our contribution to addressing at once the crippling debt of the Caribbean economies and their need to generate the resources needed to finance resilience building measures,” he stressed.